Another week and no blog update! All I can say is that we have been too busy to write. The morning we left Fairbanks we had to hitch up in the rain; this is the first time we have had to do that. It wasn’t too bad. It is about 125 miles to Denali National Park and the rain stopped near the half way point. It was very reminiscent of our first visit to Fairbanks and Denali ten years ago. 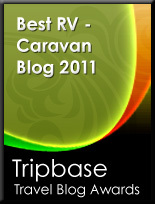 We got to the RV Park unhitched and then immediately went to make our bus reservations. What bus reservations you may wonder? 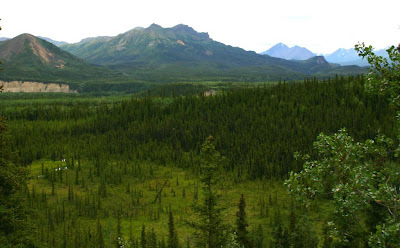 Denali National Park is over 6 million acres or 9500 square miles. That makes it 1200 square miles bigger than the state of Massachusetts, but Denali only has 1 road 91 miles long. Only the first 15 miles of the road is paved and open to the public, the other 76 miles is gravel and mostly one lane. This road is only open to concessionaire busses. So, to see much of the park you have to get a ride on a bus. The bus trips run from $89 for the “Tundra Wilderness Tour”, which most cruise ship passengers take, to $29 for the “shuttle bus”. Although the busses run from 5:10 AM to 11 PM you still need to make reservations at least a day in advance. The concessionaire is moving between 700,000 and 900,000 people each summer. So, they are taking in $40 million to $80 million each summer. 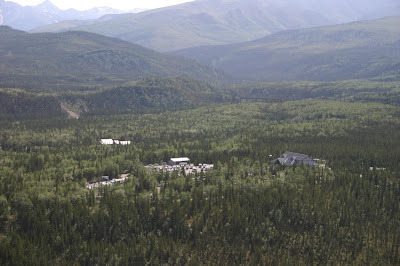 When we were at Denali in 2002 we went to a lodge at the end of the road for a few days. This time we opted for the bus to the Elision Visitor Center 66 miles into the park. 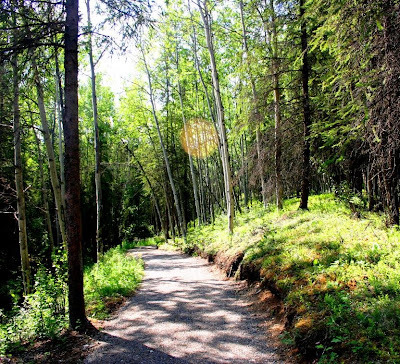 The deeper into the park you go the better your chances to see wildlife. The round trip to Elision Visitor Center is 132 miles and takes 8 to 9 hours depending on how often the bus stops to view wildlife. All of the busses stop for wildlife. The busses are all of the school bus variety so comfort is not a priority. Logic would say that the animals would be most active in the morning and you should take an early morning bus, but since sunrise is about 3:30 AM and sunset is around 12:15 AM, you can’t really be out in the park for either. Also the weather changes constantly; it can be cold and gray, sunny and warm and then thunder showers all in the same day. We opted for a civilized 9 AM trip. 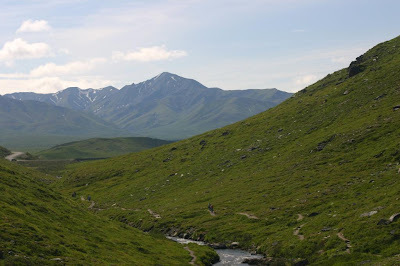 The goal for everyone is to see the “big 4”, Grizzly Bear, Moose, Dall Sheep and Caribou. 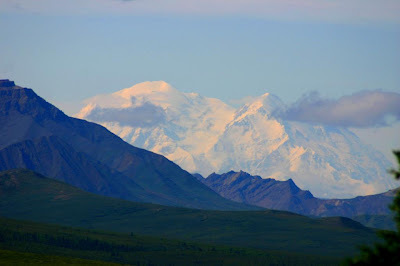 The ultimate goal however, is to get a glimpse of Mt McKinley, at 20,300 feet ,the largest mountain in North America. Unfortunately it is only visible from inside the park about 30 percent of the time and the peak is only visible 20 percent of the time. During our bus trip we did see beautiful scenery, Grizzly Bear, Moose, Dall Sheep and Caribou. However the five Grizzly bears and the several Dall sheep we saw were just too far for good pictures. 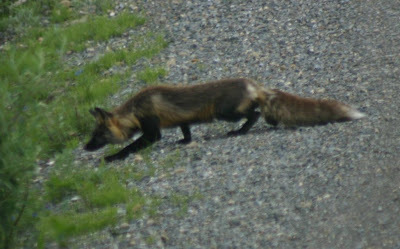 We also saw a Red Fox stalking his prey right in the middle of the road! But we didn’t see Mt. McKinley on this bus trip. At the end of the dirt road you are about 25 miles from Mt. McKinley, at Elision Visitor Center you are about 40 miles from the mountain. We saw Mt. McKinley the next day at mile post 9 inside the park when we were 85 miles from it. This was our third trip to Denali National Park and we have been fortunate to have great views of Mt. 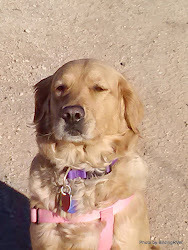 McKinley on each of our trips. 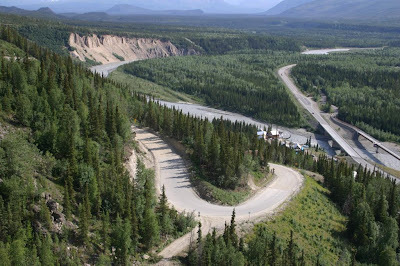 Denali National Park is divided between the “entrance area”, from the entrance to mile post 15, where the paving and public access stop and the “back country” is basically the rest of the park. Denali has very few actual trails; in the back country the shuttle bus will drop you off anywhere you ask; then you can hike cross country. When you return to the road, you just flag down the next shuttle bus to take you back to the entrance. Another difference is the back country is mostly tundra with only a few trees, where as the entrance area is mostly spruce forest. What trails there are in Denali are concentrated in the entrance area. During this visit we made it a point to hike all of the trails we could and managed to hike all but one in the entrance area. We started with the Savage River trail, which is at the end of the paved road. It is open tundra with a willow lined river. 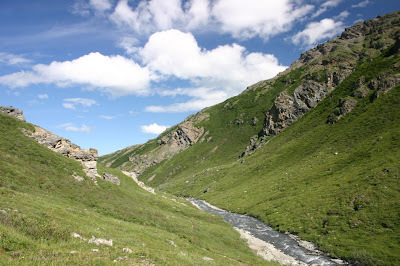 We saw Dall Sheep grazing up on the highlands, a Golden Eagle soaring near the ridges, Yellow-bellied Marmots waddling around eating wild flowers and Arctic Squirrels squeaking at anybody for destroying his wilderness experience. We naturally choose their deck to have a fine Alaskan Amber and take in the view. This is the narrow windy road up to the lodge. The hairpin turns were so tight that they had mirrors at the corners so that you can see traffic coming around the blind bend ahead of time! Yes, we need to talk about the birding. 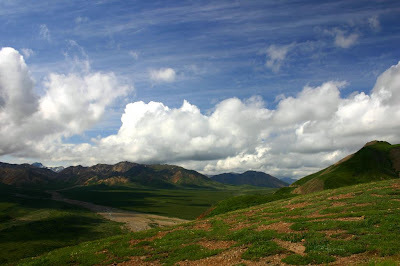 Denali National Park has a huge bird list, but with 6 million acres the birds have a lot of places to hide. The easiest to see bird is the Mew Gull which nests in the park and seem to be everywhere. 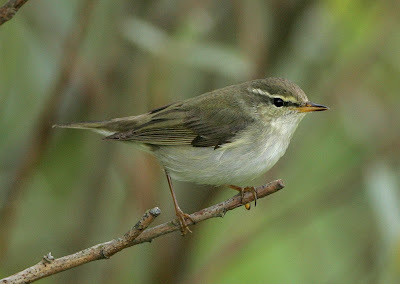 However, a prize bird to see is the Arctic Warbler. Here in Denali they are a visitor from Siberia at the very eastern end of their range. We were fortunate to find two of them 25 miles apart. Although not a life bird, as we had seen them on previous visits to Denali, it is still very special to see a bird that visits so little of North America. 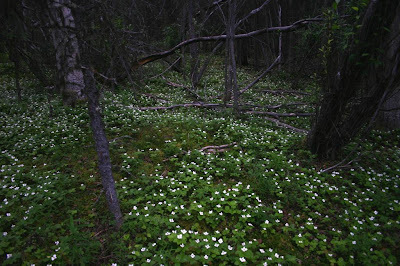 We could not get pictures of either of the Arctic Warblers we saw but here is a picture from the Internet. Another bird we sought is the Gray-cheeked Thrush. This thrush is found in Spruce forest and there are spruce forests for 1,000’s of miles across Alaska and Canada, but that just means they have more places to hide. We came across a pair that seemed to be foraging to feed their young. Again we couldn’t get a picture and not a life bird as we had seen one on our trip to Newfoundland in 2006. However, still a special bird for people from California. In the slide shows below there are many more pictures of the animals and scenery we saw. PS Today we again had to hitch up in the rain, but this time it was serious rain. Thank goodness for Goretex to keep us dry, or we’d both have drowned! I sure hope this isn’t a trend.